Increased U.S. oil production in 2013 and 2014 resulted in a sharp drop in world oil prices from triple digits at the start of 2014 to $83 per barrel by the end October. While this drop is welcome news for consumers, it could have dire economic, political and security challenges for strategic oil-producing nations, like Nigeria. 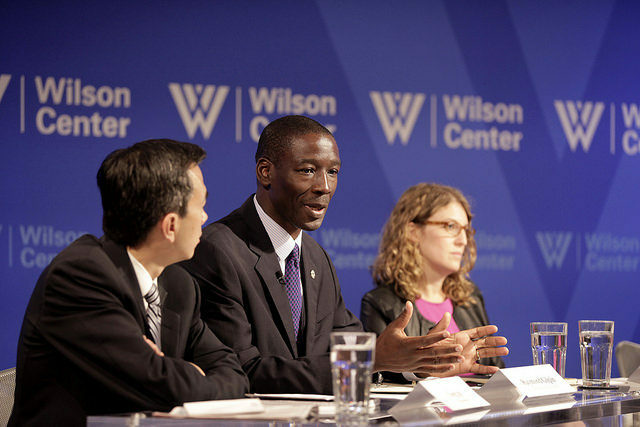 Speaking at a panel discussion, “Impact of Low Oil Prices: Petro Power or Petro Poverty?,” organized by the Wilson Center on 31st October 2014, ACSS Academic Dean Dr. Raymond Gilpin outlined important repercussions for Nigeria. Nigeria is a resource-driven economy that relies on petroleum products for 95 percent of its exports and 75 percent of tax revenue. The consequent drop in export earnings will put pressure (both actual and speculative) on Nigeria’s international reserves, which currently stand at a healthy $43 billion. A deterioration in the reserves position will undermine the relatively stable exchange rate, which has underpinned Nigeria’s recent macroeconomic gains. In addition, on account of the U.S. oil boom, the share of oil exports to the United States has dropped from 46 percent in 2008 to 18 percent by the end 2012, and continues to fall. Nigeria is being forced to diversity to more costly destinations. This further affects its trade balance and could set the stage for macroeconomic instability if the downturn in world oil prices persists for years, as some analysts predict. The fiscal impacts of the downturn are unlikely to be felt over the short term because the reserve price applied in the Nigerian government for budgeting purposes is $78 per barrel. A protracted downturn that dips below $80 per barrel will hurt and could lead to extensive borrowing and monetized deficit financing, neither of which is desirable. The immediate fiscal impact would be the continued diminution of the country’s sovereign wealth funds (funded by the difference between the reserve price and the prevailing world price), which currently stand at $3 billion, down from $9 billion a couple of years ago. Fiscal tightness in Nigeria could lead to both economic and political instability, in the run up to the February 2015 elections. 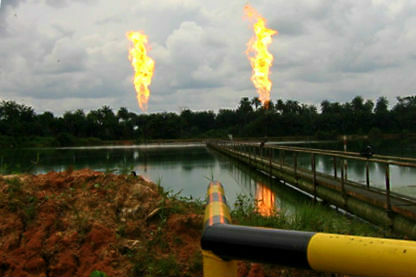 Roughly 10 percent of Nigeria’s daily output of 2.3 million barrels is lost to oil theft. Since spending is unlikely to be curtailed, the downturn in revenue receipts may lead political actors into violent competition for dwindling resources, particularly in the oil producing Niger Delta region. This could precipitate an upsurge in violence and inter-group tensions. Dr. Gilpin offered a series of recommendations to minimize the effects falling oil prices could have on security in Nigeria. The government should take immediate steps to forestall potential economic and political crises. Public expenditure management should be improved, particularly at the state and local government levels. The country’s burgeoning non-oil sector should be supported and authorities should improve the tax effort in order to maximize revenues. The government should resist expanding the wage bill and increasing spending in the run up to the elections, and put measures in place to anchor macroeconomic stability by avoiding excessive domestic and external borrowing. Credible steps could also be taken to prevent violence in the oil-producing regionsby focusing attention on the security of the individual, and not regime security. Other panelists were: Jan Kalicki, Public Policy Scholar, The Wilson Center, Counselor for International Strategy, Chevron Corporation and former Commerce Department Counselor; David Ottaway, Senior Scholar, Middle East Program, The Wilson Center and former Washington Post Correspondent; William Pomeranz, Deputy Director, Kennan Institute, The Wilson Center; and Risa Grais-Targow, Senior Analyst, Venezuela, Central America and the Caribbean at Eurasia Group. The event was moderated by Greg Ip, U.S. Economics Editor for The Economist magazine.